Apple has a margin of approximately 60% for iPhone, which means that if an OLED display costs $90 more to produce, in order to maintain margins Apple will charge the customer as much as $220 more for that feature. 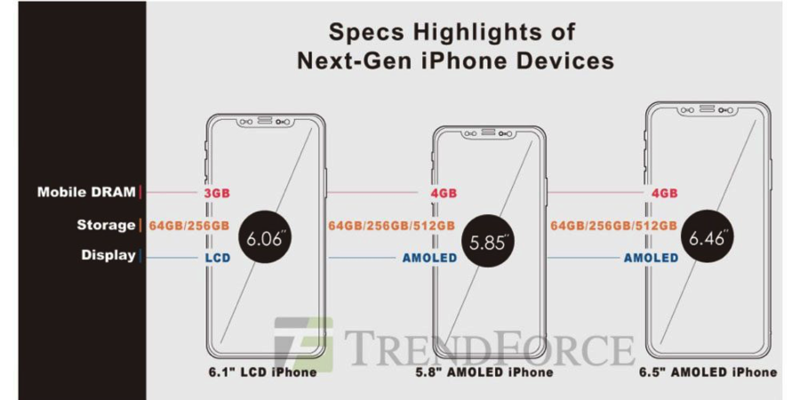 Of course, the cost of the higher performance, stainless steel chassis, and dual rear camera should bring us close to the $300 difference in cost between iPhone 8 and iPhone X. Amongst the three iPhones, if Apple uses an edge-to-edge LCD display for the cheaper device the cost should be similar to iPhone 8. If so, Apple has a very important pricing decision to make. Will it be cheaper than iPhone 8, suppress margins, and rely on the $1000+ iPhones to stabilize margins. Or will it be the priced similar or slightly more than iPhone 8, effectively maintaining or boosting margins without the need of relying on $1000 devices? I’m leaning towards the latter; it will also make it easier for Apple to maintain higher price points for its OLED devices. My guess and hope: $749, a slight price drop of $899, and $999 for the Plus. If Apple goes any higher, bravo. Samsung’s most recent 4-digit pricing gives Apple plenty of pricing power. Foldable display smartphones may soon become a reality thanks to the countless efforts of companies like Motorola, Samsung and Huawei among others. While reports suggest that Chinese phone maker Huawei could beat Samsung to launch world's first foldable display smartphone a new report says another company that LG could join the companies working on foldable displays with production of its foldable displays as early as next year. According ETNews, LG Display is working with a global original equipment maker (OEM) to produce foldable OLED panels for one of its partners, production of which is likely to begin next year. While it unclear for which company it will manufacture the foldable panels, but Google, Microsoft and Chinese smartphone maker Xiaomi are considered the potential candidates. LG is reportedly using the new atomic layer deposition (ALD) technology to encapsulate the panel. A 2017 patent shows that LG's foldable display phone has two antennas, two speakers and two microphones which are placed at the top and bottom of the phone under the display. The phone has a single camera, which is located closer to the hinges on the outer part of the phone to enable users click photos without opening the phone.